After Massacre in California Bar, Will a Democrat-Controlled House Take Action on Gun Control? | Democracy Now! Navy veteran and volunteer with the D.C. chapter of Moms Demand Action for Gun Sense in America. She is a founding member of the Everytown Veterans Advisory Council. The city of Thousands Oaks, California, is mourning after a former marine opened fire at a country music bar Wednesday night, killing 12 people, mostly students. It was the deadliest mass shooting in the United States since the Parkland, Florida, school shooting in February. Police have identified the gunman as 28-year-old Ian David Long, a Marine veteran who had deployed to Afghanistan and had a history of mental health issues, including possible PTSD. The dead include 27-year-old Telemachus Orfanos, who survived the deadly Las Vegas massacre at a country music festival last year, only to be gunned down Wednesday night. We speak with Sarah Dachos, a Navy veteran and volunteer with the D.C. chapter of Moms Demand Action for Gun Sense in America and a founding member of the Everytown Veterans Advisory Council. AMY GOODMAN: The city of Thousand Oaks, California, is mourning, after a former marine opened fire at a country music bar Wednesday night, killing 12 people, mostly students. It was the deadliest mass shooting in the United States since the Parkland, Florida, school shooting in February, when 17 people were killed. Police have identified the gunman as 28-year-old Ian David Long, a Marine veteran who had deployed to Afghanistan and had a history of mental health issues, including possible PTSD. Police said Long set off smoke grenades inside the bar before opening fire using a Glock .45-caliber handgun equipped with an extended ammunition magazine. Long then turned the gun on himself, they say. Long repeatedly frequented the Borderline Bar & Grill before the shooting and had multiple interactions with local authorities. Earlier this year, he was evaluated by mental health professionals after police responded to a disturbance at his home, where he lived with his mother, but he was cleared by the specialist. 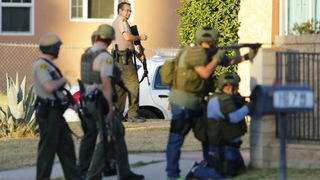 CNN reports a neighbor said Long’s mother lived in fear of what her son might do. The dead include 27-year-old Telemachus Orfanos, who survived the deadly Las Vegas massacre at a country music festival last year, only to be gunned down Wednesday night. This is his mother, Susan Schmidt-Orfanos. SUSAN SCHMIDT-ORFANOS: My son was in Las Vegas with a lot of his friends, and he came home. He didn’t come home last night. And I don’t want prayers. I don’t want thoughts. I want gun control. AMY GOODMAN: Many of the victims are students. The youngest named victim is 18-year-old Alaina Housley, a freshman at Pepperdine University. Ron Helus from the Ventura County Sheriff’s Office, who responded to the shooting, was also killed in the attack. He had been on the force for about three decades. CNN reports around the time of the shooting Long posted to Facebook, writing, “I hope people call me insane… wouldn’t that just be a big ball of irony? Yeah.. I’m insane, but the only thing you people do after these shootings is 'hopes and prayers'.. or 'keep you in my thoughts'… every time… and wonder why these keep happening,” the gunman allegedly wrote on Facebook. Well, for more, we go to Washington, D.C., where we’re joined by our guest Sarah Dachos. She’s a Navy veteran and volunteer with the D.C. chapter of Moms Demand Action for Gun Sense in America, founding member of the Everytown Veterans Advisory Council. Sarah, welcome to Democracy Now! Can you please respond to what took place, one of the worst mass shootings? It is horrifying to say that one that was even worse was just months ago. That was Parkland, the killing at the high school. And, of course, the horrific shooting that took place in Las Vegas at a country music festival, where one of the survivors of that were gunned down Wednesday night at the country music bar. SARAH DACHOS: Thank you so much for having me on the show, Amy. Moms Demand Action for Gun Sense in America is an advocacy organization that pushes legislators to pass commonsense gun legislation. And what happened in California, and what happens in the United States over and over and over again, just shows how much we need to have commonsense gun legislation passed. What happened on Tuesday with the midterms is proof that the American people feel the same way. We had gun sense champion after gun sense champion elected into Congress, and will be putting up their hand in January to swear to help and protect the American people. And one of the ways to do that is with commonsense gun legislation. AMY GOODMAN: So, talk about what you understand happened on Wednesday night. You’re a Navy vet. Apparently, Ian Long, the gunman, who may have taken his own life after killing 12 people, was a Marine veteran. Talk about your response to this, what happened, the fact that the police had been called to his house, where he lives with his mother, that his mother was afraid, mental health professionals were called in, yet he still kept his gun. AMY GOODMAN: Explain what red flag laws are. SARAH DACHOS: Absolutely. So, red flag laws is—another way to put it is extreme risk protective order. And what that does is allows a loved one or law enforcement or anybody, in fact, who thinks that somebody will wound themselves, do harm to themselves or others, they can have the gun temporarily taken away. California actually was the first state to pass the red flag laws, in 2014, after they also had another mass shooting at that time with somebody who, if the gun had been taken away, probably would not have done this mass shooting. So, if we find more information about what has happened and why this young man did not have his gun taken away, this is the type of legislation that helps with mass shootings. AMY GOODMAN: You know, a number of people have commented that the flipping of the House to Democratic, that a part of that can be attributed to the Parkland kids, the killing earlier this year on Valentine’s Day of 17 people in Parkland, Florida, and their almost immediate reaction, the survivors, demanding gun laws in the country, in Tallahassee, the capital of Florida. Many state laws have changed. Then they traveled the country in a caravan with many other young people from all over the country. Can you talk about what it means to have flipped the House, but, in fact, ultimately, on any legislation, it’s President Trump, an NRA—a major supporter of the NRA, would have to sign off on? SARAH DACHOS: Absolutely. And we can never predict—no one can predict—what President Trump is going to do. But what I will say is that by flipping the House, and specifically flipping the House with numerous gun sense champions, we are going to see these champions fight for gun sense legislation in the House. We already have some gun sense legislation champions also in the Senate. Senator Chris Murphy has been an incredible leader on this front. And with them influencing, they will be able to continue to change the culture in America and continue to work on these issues. What I will say is, flipping the House is one thing. It absolutely was crucial. And the reason that the House was able to flip was, as you implied, the Parkland students and this tide that has turned in our country since February. The tide had already been starting to turn before February. We were seeing state legislative bodies pass gun sense legislation in the last three or four years—nothing like we’ve seen this year, but it has happened in the last three or four years. And the tide just kept building and building and building. When Parkland happened, the energy and the enthusiasm and the anger of these Parkland students, and other students across the country, enabled this—or contributed to ensuring that these midterms happened the way they did on the House side. What I really want to talk about also in terms of that is, Moms Demand Action for Gun Sense in America and many other gun violence prevention organizations work on a cultural shift. It is one thing to go to the ballot, to canvass, to phone bank, to get people to the ballot. But to get people to the ballot, the cultural change has to happen. The beliefs and values of Americans has to change. And it’s changing. It is changing. We want to have gun sense legislation, because we want our communities to be safe. And I also want to bring up the point, when you say this about the Parkland students, let us not forget that there are urban students, students who live in urban environments, who have experienced gun violence constantly, who had been protesting even before the Parkland students protested, who were using their First Amendment right to protest, to engage with their members of Congress, to engage with their legislators on the city level or on the state level. And they were turning the tide, as well. This tide has been turning for a long time. AMY GOODMAN: Someone pointed out that this was the 304th mass shooting in the U.S. this year—almost one per day. Finally, I want to go to the military background of the shooter. You’re a Navy veteran. He was a marine. He served apparently in Helmand province in 2010 at the height of the surge, was a gunner. He used a Glock with an extended magazine. And, you know, there’s not a lot known at this point, may have been suffering from PTSD. But can you talk about this military connection? And then also, you know, the gun he used and the magazine, why he had that, and was this magazine illegal at least? SARAH DACHOS: Right. My understanding is that the magazine was illegal in California state law. So, it’s not clear to us how he was able to obtain that magazine. What I can tell you is that states—even though California has some of the strictest gun laws in the country, states around California do not. And in terms of his military experience—yes, I am a Navy vet, and my role as a Navy vet and my role while I was in the military was, when we’re around weapons, we are safe around weapons. And I’m sure this young man was taught, in his Marine Corps time, how to be 100 percent safe with his weapon, how to lock it up, how to keep his ammunition separated from his weapon. When it comes to the PTSD element, we have vets who have suffered from PTSD. We have—the numbers are incredibly heart-wrenching, how many vets die a day from self-inflicting wounds with a gun because they have access to guns. AMY GOODMAN: We’re talking something like 17 vets a day kill themselves? SARAH DACHOS: I’ve heard numbers that are above 20 vets a day. And it’s part of the reason that I got involved with Moms Demand Action for Gun Sense in America, that, as a vet, to know that my fellow vets are in situations where they are so devastated by what happened to them while they were serving in the military, or maybe even not while they were in the military but have these mental challenges, are so stressed that they feel that they want to take their own lives. But also, not to veer—steer away from the veteran aspect of it or the military aspect of it, we have this issue with Americans all over the country, whether they served or not. We have this issue with students and youth who live in urban environments where gun violence is the reality of every single day. So, this is an issue that we have to address across the country. This is an issue where if we are going to lower gun violence, whether it is with mass shootings or with everyday violence that happens, whether it’s suicide—like I said, 67 percent of Americans die because of suicide, with a gun—we need to be working on the mental health aspects of this, too, in how we prevent violence through community-based approaches. SARAH DACHOS: At the end of the day—uh-huh? AMY GOODMAN: Last 10 seconds. SARAH DACHOS: Yes. Oh, sorry. At the end of the day, we need to prevent access to guns, because that is the prevalent issue, the ubiquitous issue, is that guns are so accessible. AMY GOODMAN: Sarah Dachos, I want to thank you for being with us, volunteer with the D.C. chapter of Moms Demand Action for Gun Sense in America, founding member of Everytown Veterans Advisory Council, a Navy veteran. This is Democracy Now! Back in 30 seconds with what’s happening with the races in Florida. AMY GOODMAN: “Stand Up for Something,” Andra Day at the March for Our Lives, with the Baltimore Choir, in Washington, D.C., last March. Eight hundred thousand people marched against gun violence.